Two Bears Farm and the Three Cubs: One of My Favorite Restaurants Ever! One of My Favorite Restaurants Ever! Last year on our wedding anniversary we went out to eat at The Homeplace. I always joke that I ate so much that it caused my water to break later that night. We thought it would be a fine tradition to return there for our anniversary this year. 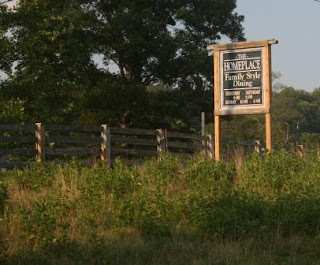 The Homeplace is in Catawba, Virginia. It's inside a historic farmhouse and is family friendly. Expect a wait when you get there. Stick your name on the list and then wander the property. 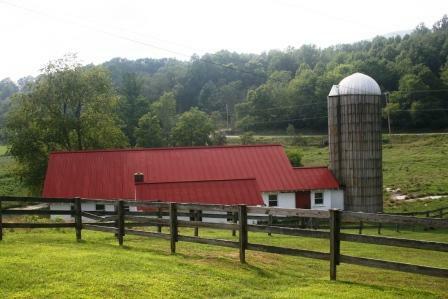 It's in a beautiful part of the Appalachians, and has long been a popular stopping place for Appalachian Trail thru-hikers. 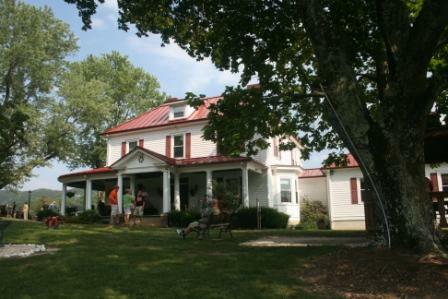 It's also a popular place for Virginia Tech students, and there was a wedding occuring last Saturday. 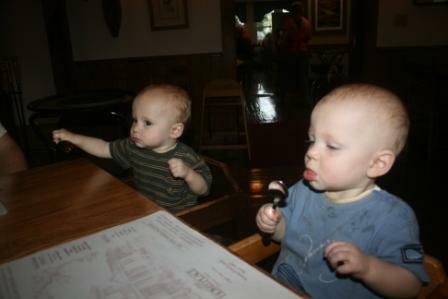 Cort and Reid bang on the table in anticipation with their spoons. 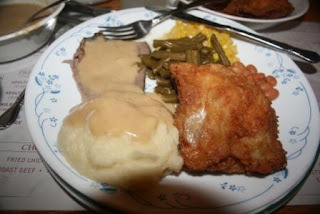 You get the choice of 2 meats (fried chicken, roast beef, or ham) and then they bring out tons of sides. It's all you can eat, and the bowls are placed on the table. Corn, pinto beans, green beans, biscuits (with chow chow or apple butter), cole slaw, mashed potatoes, gravy, and the 2 meats. And my gosh it is SO good. Included is dessert...cobbler with ice cream. A different type each day, and Saturday was cherry cobbler. While I probably wasn't as full as I was the year prior, at 38 weeks 3 days preggo with twins, I was pretty stuffed! Hopefully this time we won't wait a full year before going back. Never been there but it sounds great! Sounds very yummy! Yeah I wish it was closer here too. First I was ooohing and ahhing over the sweet babies! Then I was ooohing and ahhhing over that fried chicken!!! That is making me HUNGRY girl!! Here from Mom Loop Friday Follow!! Glad you joined us! I'm also your newest follower! Mashed potatoes are my all time fave comfort food ever, so I'm in! And the dessert, pass me a spoon, wouldja? We have a german restraurant in Amana Colonies that we like to go to at least twice a year.. You pick the meat you want and the sides come in lots of bowls.. Homemade breads are on the table. and dessert is home-made pie.. 8 differnt kinds.. I usually eat the red raspberry pie.. 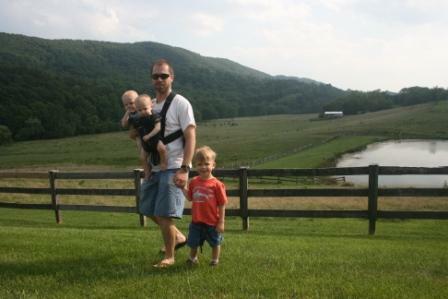 I marveled at the picture of your husband carrying the twins... Oh my, I didn't know they made those carriers to hold two.. He must have a strong back... They are growing up so fast.. and they are so cute. That looks delightful! Had some drive time thru VA the past 2 weekends (17 from mountains to Norfolk)-- such amazing places like these!